WRESTLING 101: The Highs and Lows of The Tinkerbell C-L-A-P! The tinkerbell effect is to wrestling like the flaming ashes are to the mythical phoenix. The audience all agrees to will someone to life through the power of their collective belief most likely demonstrated through clapping, stomping or chanting. Or as the WWE’s New Day have it ,”clap therapy” saves the day bringing a reborn energy into the face or tweener to overcome the odds. The tinkerbell effect draws the audience into the action helping to make them a live part of the event. It gives the audience a shared sense of control. The sense that we can influence the events unfolding by transferring our combined energy to the flagging wrestler barely clinging to hope. This simple act of belief can turn the tide for the better leading to a victory brought in part by the power of our imagination. Yet, despite my silly ramblings, the tinkerbell clap has it draw backs in professional wrestling. To put it simply, it is overused and kind of boring. While the tinkerbell clap encourages audience participation and buy in, it also serves as a herald of the direction of the match usually ending in a predictable reversal. The scrappy under-dog will triumph in the end. Said clapped for babyface will manage to escape the headlock and overcome against all odds. And yawn! Tinkerbell is a fairy, a flash of light on the wall in many versions of Peter Pan. She is endearing in her childlike simplicity that good will come to those who deserve it; those who truly believe. Well tinkerbell is wrong and most of it know that from first hand knowledge. Good things don’t happen just because we believe they will come. They happen sometimes randomly and often through tremendous amounts of effort and sacrifice. Bad things happen too and often to those who are “good” and truly believe. Sometimes we are to blame for these bad things and sometimes they are from events out of our control, and even tinkerbell couldn’t help us. Professional wrestling can be escapism from reality, it can help us all say “I do believe in fairies” no matter our age. But wrestling can also mirror reality in a beautiful way, showing us that people cheat, are narcissistic and even “good” guys are flawed. So I think the New Day say it the best by not saying anything at all. 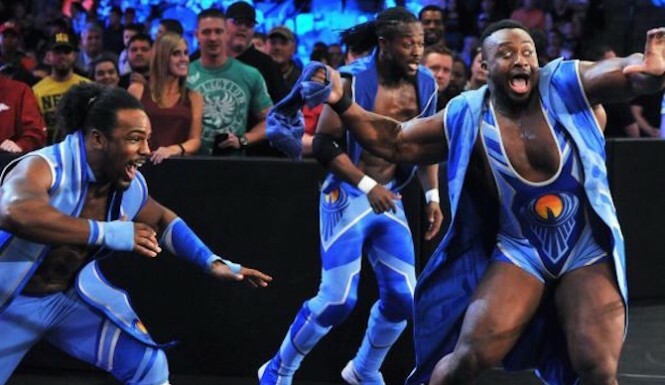 Kofi, Big E and Xavier skip and clap their way down the aisle and in the ring mocking tinkerbell and all her big hearted, Disney, simplicity. Because the power of positivity is fun and it gives us the illusion of control, but it’s also kind of stupid. The ironic genius of the New Day reflects this. That omnipresent sun on their uniforms? Why it’s the top of said phoenix. Rising from the tinkerbell ashes. New. Day. Rocks. Tinkerbell or phoenix? That’s your call.